This template provides an outline UML model which may be used to capture a Service Model and all its detail. This template is provided for IBM Rational Software Modeler v6.0.1 and the attached files consist of a reusable template model and also the corresponding implementation of the UML Profile for Software Services (see Whitepaper: Unified Modeling Language (UML) Profile for Software Services). 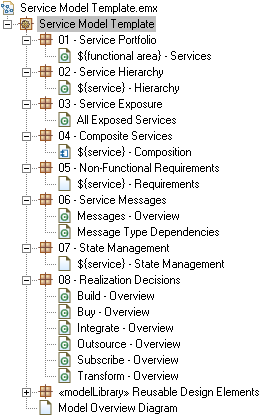 The template consists of a set of packages corresponding to the different view-elements in the Service Model, these can be seen in the screen-shot below. The UML Service Model may be the primary delivery artifact, but in many cases it will be delivered in conjunction with additional content in document form, in this regard refer to the Template: Service Model in Word.